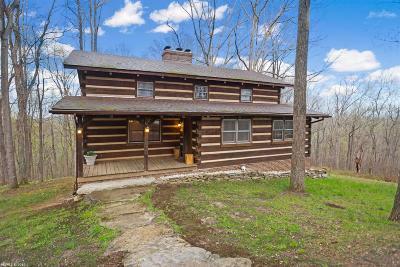 Enjoy the seclusion of this 12 acres but yet only one mile to Christiansburg. This log home with impressive beams and open floorplan is both functional and relaxing. The texture of the logs and the rich colors in the wood floors make you feel right at home. There are 3 bedrooms upstairs with 2 baths and there are 2 office areas on the main floor. The lower level walkout basement has a family room and another full bathroom. There is plenty of room to enjoy the natural beauty of this land. Directions: Roanoke Street To Mount Pleasant, One Mile To Left On Georges Run Rd. First Driveway On Left.